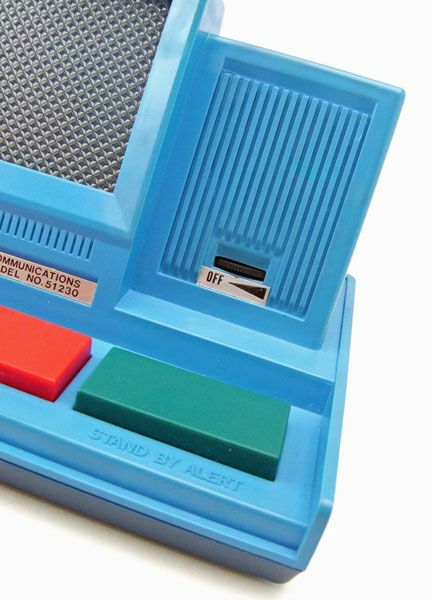 The Rundown: Okay... let's say a couple of your buddies own the awesome Mego Communicators. They head over to your tree house and start pretending to be Captain Kirk and Spock. You feel left out. Then all of a sudden you remember that Command Communications Console that granny bought you for Christmas. You run inside, rip open the box, and slap a few batteries in it. Suddenly your tree house has become the Enterprise, with Kirk and Spock down in the yard on a mission to the planet's surface. It's up to you and your console to keep the landing party in constant contact with the ship, just in case something goes wrong... and you know it will. Well, at least that's what I'm assuming Mego had in mind when they created this guy. 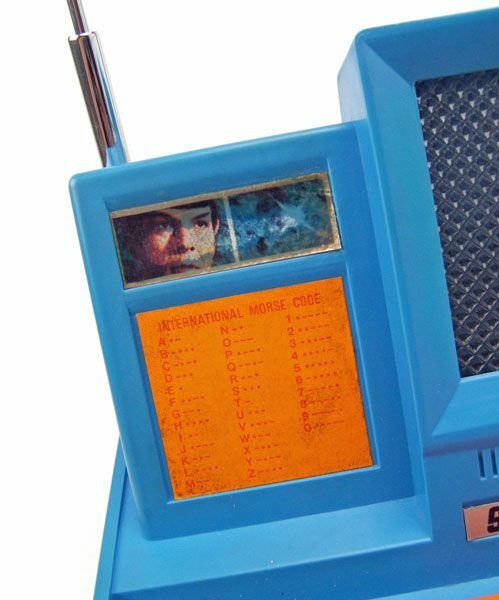 It's basically just a big walkie-talkie with a lighted screen, but kids didn't need to know that. 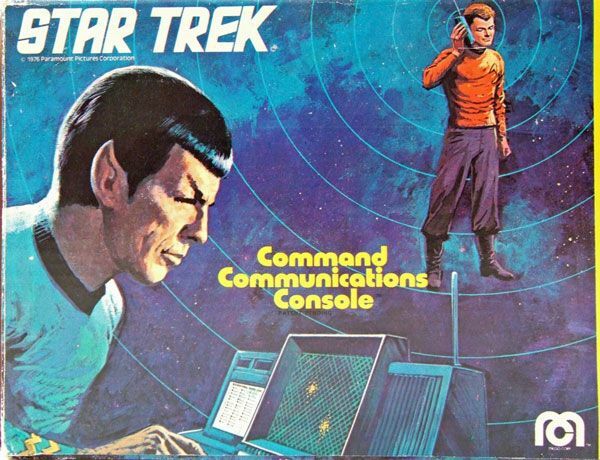 Bigger means better, so the Command Communications Console must have been at least 3 times cooler than the regular Mego communicators. Plus it uses alliteration in its name. Bonus points. ...and to the left are a couple of nice decorative stickers. 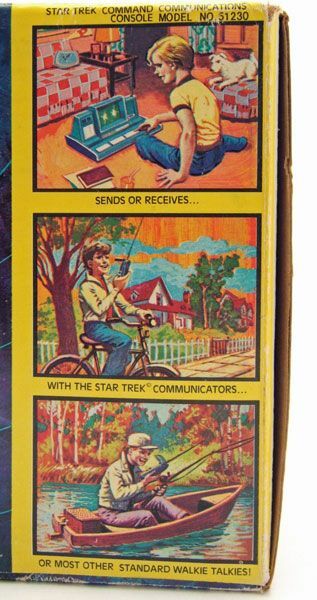 The top sticker features Spock peering in at you through a tiny viewscreen. Quit looking at me Spock. The lower sticker is actually pretty useful, as it provides Morse code translations for you to use on the console's buttons. Behind the stickered area you'll find the console's antenna. 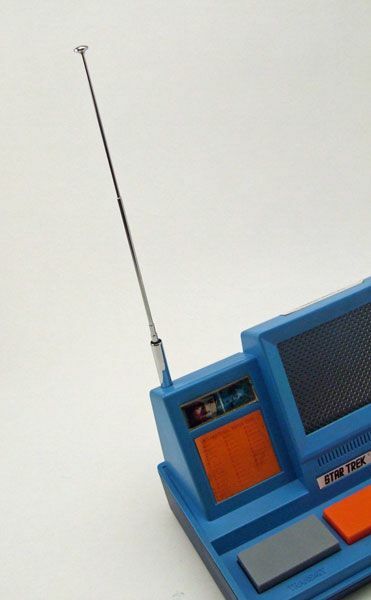 The antenna is REALLY long. So long, in fact, that I couldn't fully extend it in this pic. So don't be a Herbert- leave plenty of head room when positioning your Command Communications Console. At the console's center is the "multicolor phaser light screen". Translation- It's a screen with four little lights inside. 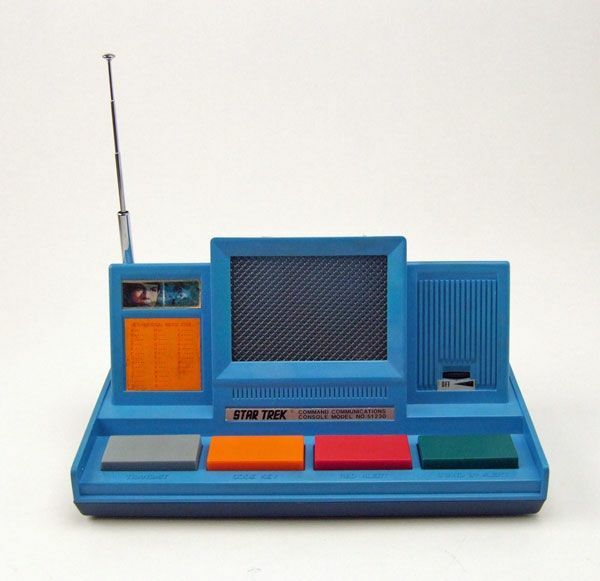 While it may seem tame by today's toy standards, this screen probably upped the coolness factor of the piece by about tenfold back in the 70's. The Bionic Woman makes everything better. I seem to remember seeing these boxed in a department or toy store back in the seventies, and turning my nose up at it... not authentic enough for lil' David back then. But, I'll bet you if I had seen one in action at a friend's house at the time, I would've really wanted one ( you're right...those flashing lights WOULD have upped the coolness factor, and fired up my imagination back then ). You do find the niftiest stuff, James. 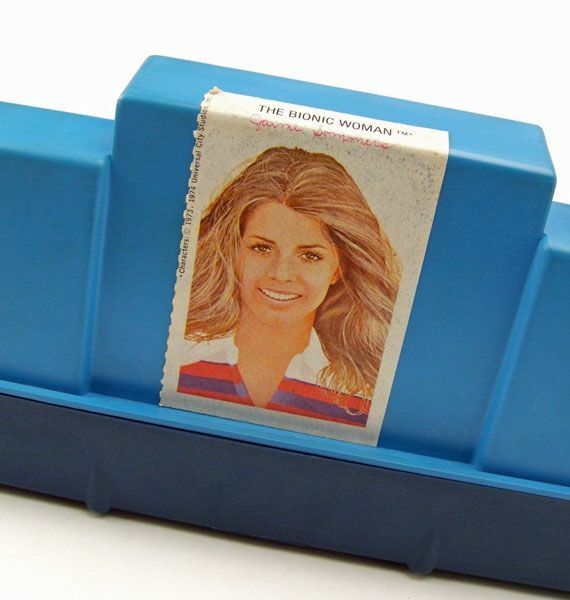 The Bionic Woman sticker is from a box of Lucky Charms. I don't know why I remember that. That thing was super cool. We kept it in my garage, which was the ship, while the backyard was the planet. It did a reasonably good job of sending signals back and forth with the communicators. Pretty cool. Did anyone answer your call? This is a great little toy. 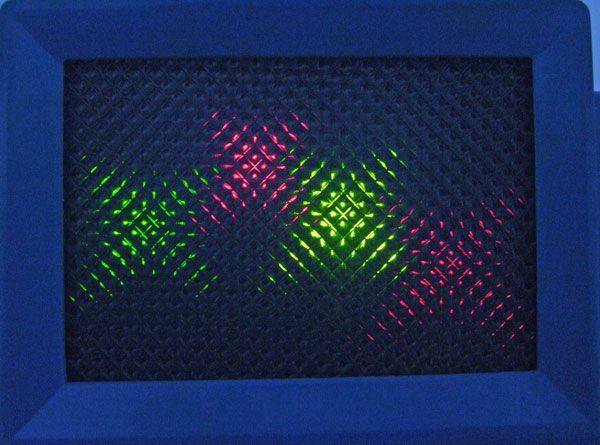 I love those colored lights behind the mesh screen -- way cool. I still have mine in a box in the closet! I've got the communicators. 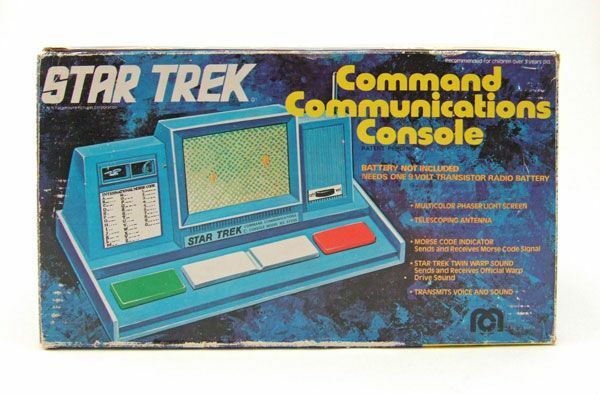 Now I'm working on getting the Command Communications Console! My kid loves the walkie talkies. She is gonna love the Console I bet too, when I get it. 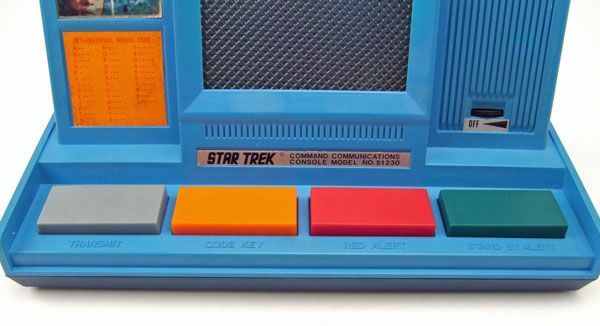 I just listed the Star Trek Command Communications Console on eBay.